This Unibet review will introduce bettors to the wide variety of products, services and offers available across the Unibet sportsbook, which is one of the largest and best in the business despite not receiving the publicity enjoyed by major brands. We came across an interesting welcome offer during our Unibet review, with new customers simply entitled to an exclusive promotion upon signing up through an affiliate link. New players can get up to £50 when placing their first deposit as the operator will match this up with 100%. A comprehensive spread of men’s and women’s sports markets from around the globe was available during our Unibet review, with the mix on offer among the best in the industry. A total of 31 categories, each complete with deep markets, are available to Unibet customers. They range from popular options such as football, tennis, golf, basketball, rugby and motorsport, to non-sports categories, including politics, TV and novelty, and WWE. The football offering is without a doubt Unibet's cornerstone, with an astonishing 15,025 markets open at the time of writing, including 47 live events. These figures are even more impressive when you consider it is the offseason in many European football competitions. Horse racing and greyhound racing from the UK and abroad are also covered in full, with races that are about to jump prominently displayed on the Unibet website and mobile app. Unibet is currently launching a new Bet Builder product on the UK market. the solution, that is promised to be faster and smarter than competitors' ones, allows bettors to create custmon betting selections. The Bet Builder supports both pre-match, live and cash-out. Unibet's odds, especially when it comes to football, are excellent. Bettors will often find slightly higher odds here as opposed to more high-profile bookmakers, particularly for major football leagues and tournaments such as the English Premier League and UEFA Champions League. There's value on offer in tennis and US sports, as we discovered while perusing through French Open, NBA Finals and Stanley Cup (NHL) markets during this Unibet review. Unibet boasts a wide selection of live betting events, with customers able to make both single and combination plays on live sports action. Customers can also watch and bet via Unibet TV, or consult an in-play scoreboard and stats where there is no live stream of an event available. As with numerous bookmakers' live betting offering, there is also a cash out feature, giving bettors a chance to claim winnings before a current event is finished. Unibet TV is free for customers who have money in their account, and streams over 40,000 live sporting events per year; this is as impressive a live streaming lineup you will find at any bookmaker. There were NBA and NHL streams, as well as French Open tennis available during our Unibet review, while the football offering is again strong, with La Liga, Serie A, Eridivisie and Championship among some of the leagues covered. The sports app is available for iOS and Android customers and comes complete with Unibet TV, a live streaming service which is elaborated upon later in this Unibet review. The integrated sports streaming is a huge plus for bettors who like to watch and wager from their mobile device. Bettors can easily access a large spread of pre-match and in-play betting markets through the easy-to-use app, which isn't overly flashy in design but the does the job well as an on-the-go betting companion. Another feature of the app that impressed was the ability to set sports-specific notifications for major events that bettors have a stake in. Unibet deposits and withdrawals can be made quickly and securely via various methods. Users are urged to login to their accounts and head to the ‘Deposit’ page, from where they can view the varying commission Unibet charges across its deposit methods. We found there to be a lack of clarity around these fees during our Unibet review, and the fact a commission is charged in the first place is also a letdown. On the plus side, Withdrawals are free and can be made to the same credit/debit card and e-wallet that was used to deposit, as well as bank transfer. Slow response times hindered this part of our Unibet review. While the 24/7 customer service is undoubtedly reliable, it's not efficient, with response time across live chat particularly slow. Additionally, Unibet's telephone customer support is not available after 11pm, conceding more ground to competitors in this department. 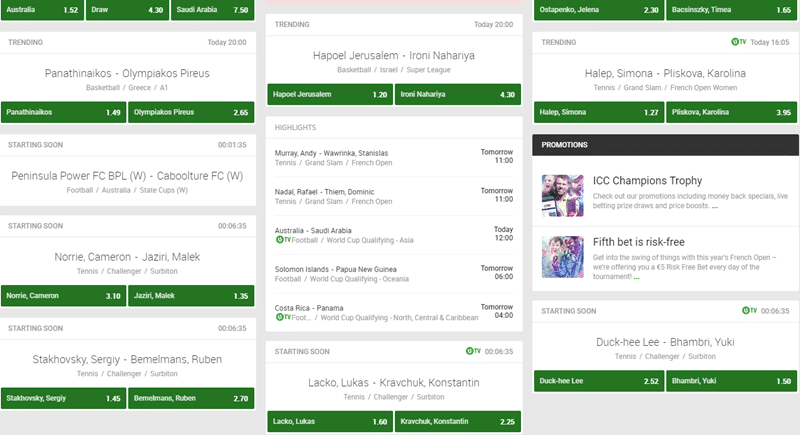 A lacklustre customer service offering and deposit fees aside, Unibet remains one of the most underappreciated sportsbooks in online gambling. The rich array of markets and in-play betting options, tallied with excellent odds and a live streaming service that eclipses that offered by many rivals, lead to an overwhelmingly positive Unibet review. And remember, if you're a new customer who signs up via one of the above links with Unibet and meet certain terms and conditions, you're entitled to a deposit bonus.